Soldering irons. How do they work? I’ve been soldering things since I was in junior high school, and…that was a long time ago. I’m good at it. I haven’t had a soldering injury for fifteen years. But when you do most of your soldering between midnight and 2am, you’re bound to make a mistake sooner or later. Wound is sterile due to high temperature. Disconcerting burned-human-flesh smell. Wound doesn’t bleed due to instant cauterization. Hurts like a motherf****r.
So given all that, I’m going to have to go out on a limb and officially not recommend stabbing oneself with a precision 18W soldering iron as I did last night. The more you know. Over the weekend I finished up the power wiring for the suit and did tests with the suit running exclusively off battery power. The astonishing part is just how much energy 250 RGB LEDs can use. This table shows LED color (in HTML #rrggbb format) with corresponding power consumption in amps and watts. A dim color (like #010000, which is the dimmest possible red) will use less energy than a bright color (like #ff0000, the brightest possible red). Using more than one of red, green, and blue, also uses more energy. The most energy consumption comes from #ffffff, which is the brightest white the LEDs can produce. Sadly my batteries can’t put out enough power for me to run the suit that bright. So at half-brightness white, my suit pulls an amazing 8 amps at 8.13V, or about 64 watts. More than a standard 60-watt lightbulb. Fortunately the suit makes more light than a dinosaur incandescent lightbulb, plus can generate any colors I want and animate at 40 frames per second. I’m currently constructing the final circuit board that mates the daughterboards (XBee, Bluetooth, and micro-SD reader) to the Arduino Mega. That will probably be done by Wednesday. Wednesday night I finished fabricating the belt I will wear inside the Anthrolume 2.0 suit. It is an iteration of the belt I built for the original Anthrolume suit and reuses most of the materials from that belt. The new belt holds 12 LiPoly batteries in two separate power circuits, and has a new power consolidation and distribution box that mounts near the middle of my back to send power to various points within the long strand of 250 LEDs mounted into the fabric of the suit, and to the Arduino/radios. Here’s a short video showing the parts of the belt. 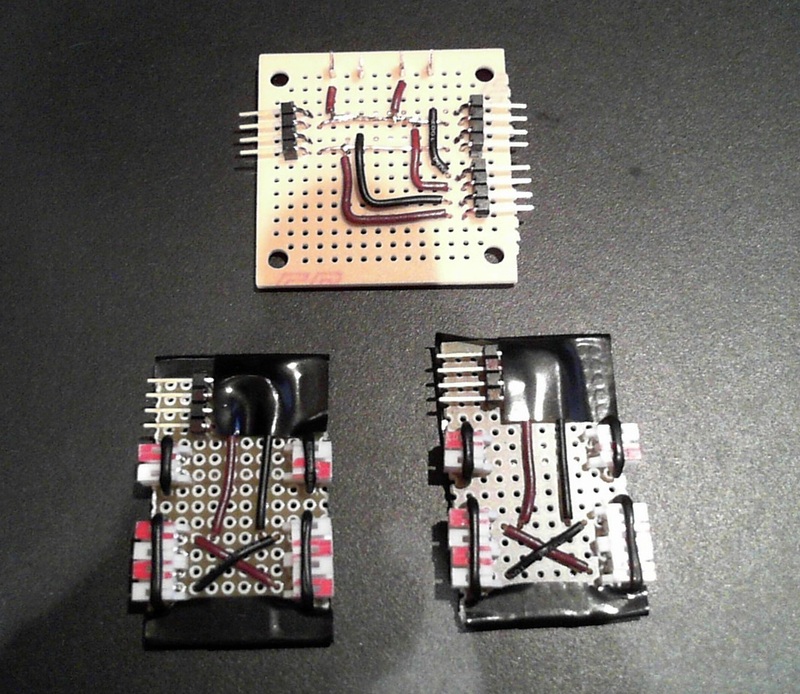 Tonight I finished the three custom circuit boards that serve to consolidate the power from Anthrolume’s 12 lithium polymer batteries into two circuits. Eight of the batteries are arranged in series-parallel to deliver 7.4V with 10.6 amp-hours of capacity. That circuit powers the LED strand. The second circuit is also series-parallel delivering 7.4V with 2.6 amp-hours of capacity. The latter powers the Arduino Mega and its three peripheral boards (SD card reader, XBee radio, and Bluetooth radio). Next is to create the wiring harnesses that go between the battery boxes, the power distribution box, and the Arduino box. After quite a bit of wiring work, I’ve got the suit functioning. Shown here still inside-out, all 250 LEDs are properly placed except for the ten that go on the head. They’ll be mounted on a hat but they’re just wrapped around the top right now. The video also demonstrates bluetooth remote control from a custom Android control application.